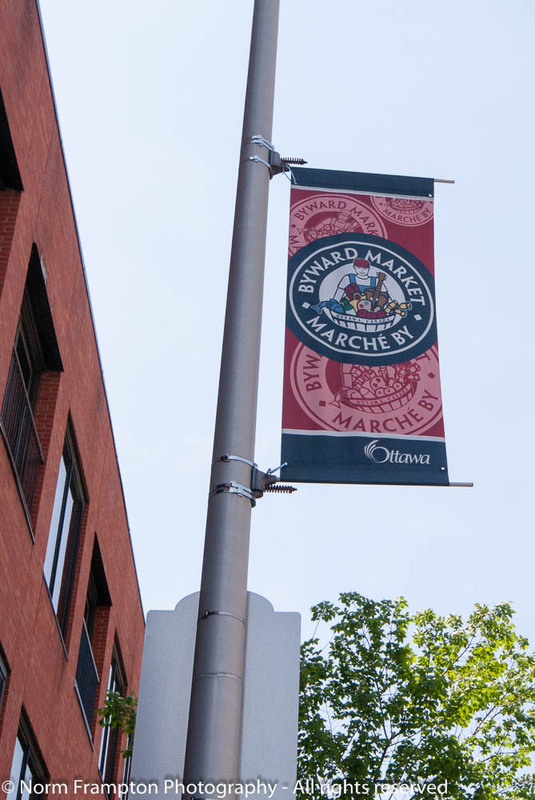 Historically speaking the ByWard Market area of Ottawa has played an integral part in the economic and political development of what eventually became our nation’s capitol. 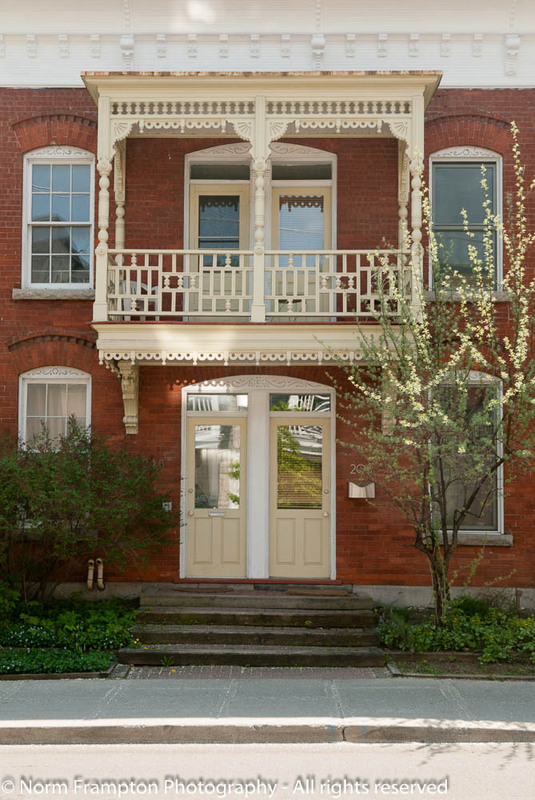 Established in 1826 by Lt-Col. John By, the man in charge of building the Rideau Canal, it is not only one Canada’s largest and oldest markets but a major tourist attraction in the capitol region. 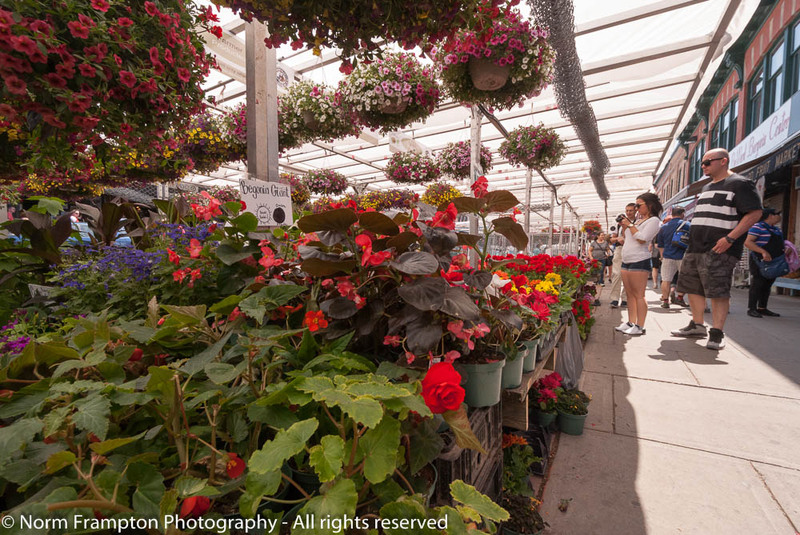 On a typical summer weekend they say that as many as 50,000 people visit the market. Today this historic neighbourhood which borders Parliament Hill, contains an eclectic mix of residential streets, bars, restaurants and shops, as well as both indoor and open-air markets. This one needs some TLC but has sooo much potential. 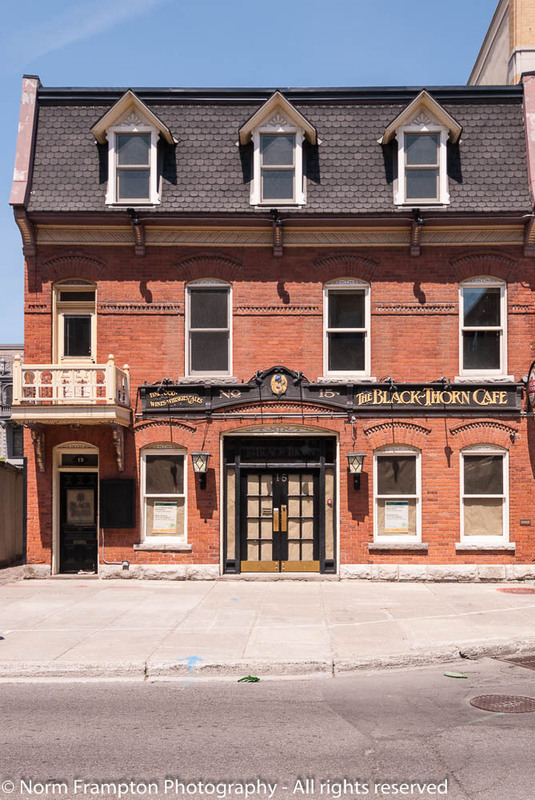 The Black-Thorn Cafe was closed for renovations so we couldn’t go in, but what first caught my eye was the nice black and gold sign and trim and how it fit so well against the red brick. I loved the clean lines of this door to an haute cuisine, fancy-pants restaurant in an old stone building – I just couldn’t think of any reason for the handle to be set so low in the door except perhaps for wheel-chair access – which doesn’t make sense either because of the step just below the door – who knows? Partly in shadow but facing into the sun I simply couldn’t find a spot to stand where I could avoid lens flares on this shot. 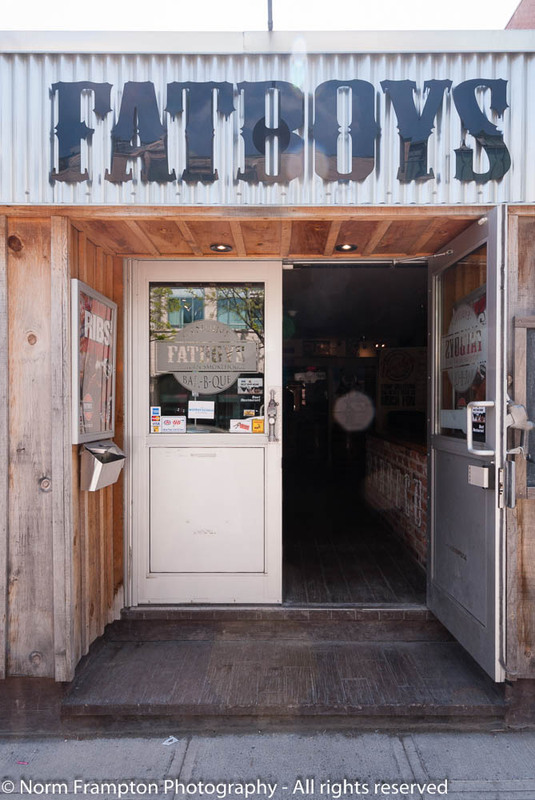 At first I walked right past FatBoys Bar-B-Que because…well politically incorrect much? Plus the plain steel door didn’t really impress me. Something tells me salad is not a menu priority at this place. Thankfully Honey was paying closer attention and pointed out something about the doors that I hadn’t noticed. My nominee for all-time coolest door handles ever! This one is from a previous visit in late winter (yes that’s a bit of snow on the upper balcony) – I was looking for an excuse to throw it into a post somewhere because…ooh goodness, the detail work on all of that decorative trim! And the door is kinda pretty too. 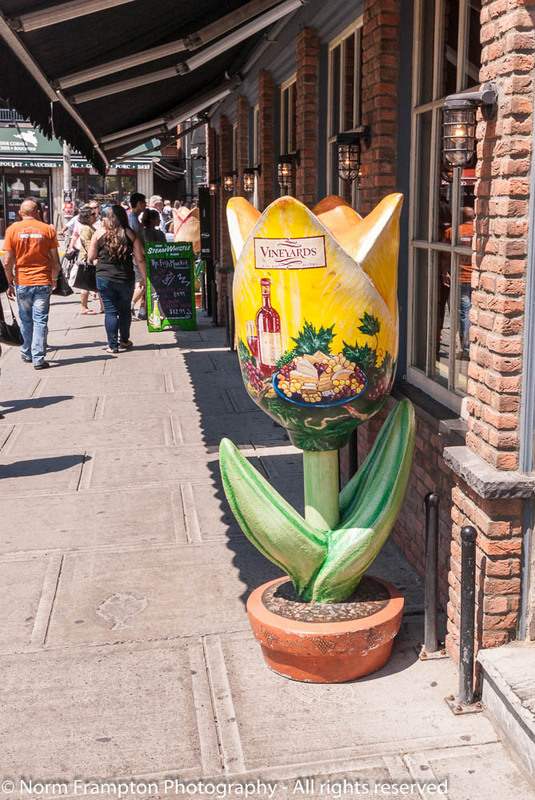 Naturally during tulip season the shops in the market get into the spirit as well. If you ever visit Canada’s capitol, I’d suggest that an afternoon walking tour of historic ByWard Market is a must. Extra important note: WordPress has been having problems with pingbacks recently and since I’m not sure if they have it fixed yet, please do make sure to click on this blue button and add the link to your own Thursday Doors post to this week’s list – we do want as many people find your post so we can see what’s shaking with doors in your part of the world. 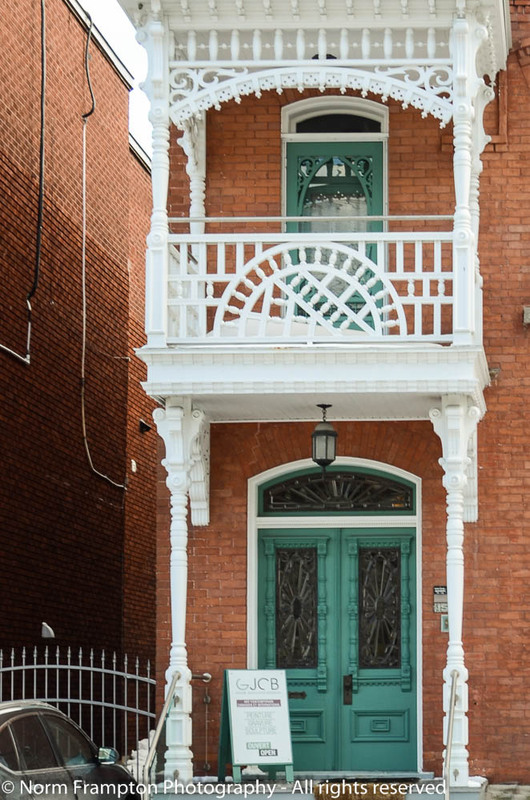 Gallery | This entry was posted in Photography, Thursday Doors, Travel and tagged Byward Market, Canada, Doors, Historic Architecture, History, Ottawa, Thursday Doors, Tourism, Walking Tours. Bookmark the permalink. I second your nomination for the all-time coolest door handles ever. 😉 nice way to preserve the old gas pump stuff – hope u have a great week N…. Thank you for a very nostalgic trip. It’s nice to see that the Byward Market and the area around it are benefiting from extra care. I last lived in Ottawa over 20 years ago, and rarely been back. Love he green JCB door with he white railings. Interesting collection. Love the brick and black door combo, very classy and bold. The door handle that was low? Hmmmm, very odd indeed. Maybe it’s a kids place or frequented by vertically challenged people? (Isn’t that the politically correct term these days?) And the door handle that was a gas pump….way cool, but yeah, the door itself was less than exciting. Thanks for joining in this week Michelle. In future the link goes in the link-up list (look for the blue button), not in the comments section. Thanks for joining in this week Judy. In future the link goes in the link-up list (look for the blue button), not in the comments section. Sorry, Norm.. I’ve done that in the past.. Mind lapse! I love unusual door handles. In my last house before I moved to Mexico, every door handle inside the house was different, formed from redwood branches and burls.. Loved it. My favorite photo here, of course, is the gas pump handle. How fun. Love Chez Lucien’s door! If you liked the Tulip festival I hope you’ll get the chance one time to visit Holland’s “Keukenhof” maybe smaller than in Ottawa, but in the Keukenhof you see the newest tulips they have developed. 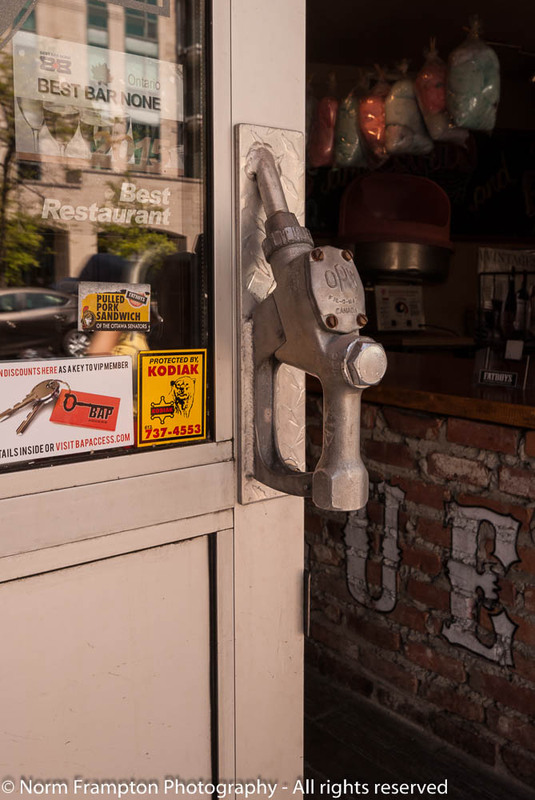 I love the door handle on the Fatboys restaurant. (Did you know there is a model of Harley-Davidson called Fat Boy?) My favorite door, though, is the last one. It might take extra work with the paint, but it is well worth it. That’s a beautiful door and balcony! Hi Norm, your doors are great as always. Here is mine. Ordinary doors with a slightly different perspective. I love wandering around markets, that one looks fabulous. The balcony in the second photo is gorgeous – love it! Great selection, Norm. I am looking forward to sharing a few more installments in coming Thursdays of other doors found throughout Paris. Thanks. I’m looking forward to seeing what other awesome doors you found in Paris. Ok. Thanks! I’ll try to figure it out. Presumably the one for that week? Definitely. I follow a lot of people and have met a lot of new bloggers through your doors! During a recent trip to Paris I took some great photos of amazing doors. Installment one can be found here…they focus primarily on the Notre Dame. Please check it out and let me know what you think. I can’t wait for the next few thursdays to share the rest with you! Thanks Norm 2.0 for your great challenges! Was hoping someone could answer the mystery of #18? Maybe if it’s such a fancy pants restaurant, patrons must genuflect before gaining access? Love your tours and including us. Yes I heard about that. Right beside the Rideau Centre Mall I believe. We probably walked that stretch when we were there – scary stuff. Oh, how I love wandering around the Byward Market! Such an eclectic neighbourhood & they have Beaver Tails! Great post, Norm. I’ve really become a fan of the door series, thanks to Dan Antion, our mutual friend. I don’t think I do, but Dan has gotten me into taking a closer look at the ones I do see. Interesting collection, I especially the penultimate green door. I love the set of green doors, Norm, and the pump handles on Fat Boys. As for the latter being politically incorrect, we have a chain of restaurants called Potbellys and they seem to do very well. Just attention-getting rather than non-PC, I think. Pretty cool eh? I walked right past it. Honey was the one who said “whoa, come back here and look at this”. Thanks Judy. Yes the ones with the balconies are my faves too. I like market places, wish I could go there! 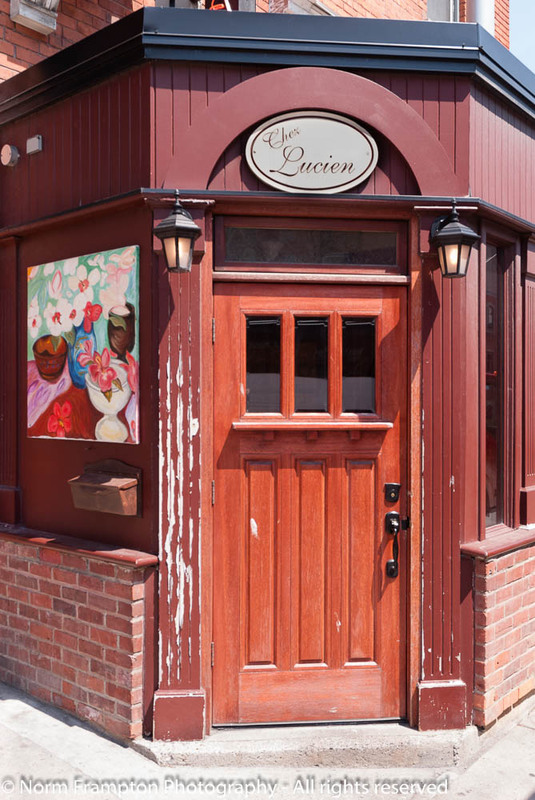 🙂 The “Lucien” door was my favorite and the tulip art piece charming, Norm. Happy Thursday’s Doors and have a wonderful weekend, too! Thanks Dan. These days Honey has always got an eye out for doors. Your Editor scouts them for you too? There is so much to like in here, Norm. I like it all from the tulip statue to the 3-door special of the Black Thorn Cafe. If forced to pick a favourite, I’d be choosing the last set of green doors with the intricate lacey balcony. 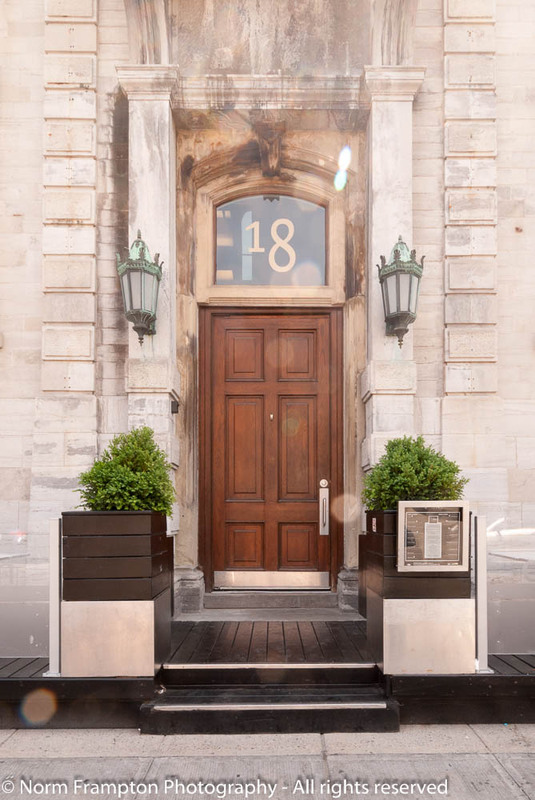 Not to be outdone by the balcony, the front doors have a lot of intricate style of their own. It’s an odd choice for me considering that in my own life, I tend to lean towards clean, simple lines. You keep adding to the reasons of why I need to return to Ottawa for a visit. I haven’t been there since “before children”. Thanks Joanne. I’ve been rediscovering Ottawa myself recently. We’ve been a few times in the past year, partly because it’s relatively close and partly to visit family as well.